Read the 2017 Conference Proceedings! Register online or see the 2017 Conference Form . 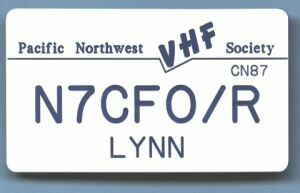 for the 23rd Annual PNW VHF Society Conference! 70 people registered online (see list below). 3000 Marina Drive, Moses Lake, Washington, 98837. See Google map . Call the hotel reservation desk at 509-765-9211 to reserve a room. Note that breakfast is included. The Society has not reserved a block of rooms - so if you use Expedia, AARP, or even just a senior discount then rate would work out to be the same as what we could negotiate. Conference registration is $45 before Oct 1, or $50 at the door. Register now. Please check your registration and badge order. Contact Jim K7ND , Secretary PNWVHFS to make corrections.